Don’t trust the safety of your kayak to imitators with their bolt-together two-piece designs and small weight capacities; they’ll weaken and collapse the first time you turn your back leaving your boat in a sad, damaged pile of would-have should-have could-haves. And for what, easier packaging? 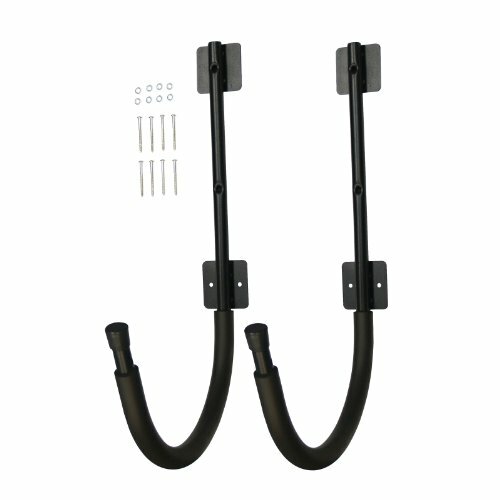 The Extreme Max 3005.3474 Kayak Wall Cradle Set has the strength and capacity to keep your kayak safe and secure with a 200 lb. capacity and a limited lifetime warranty to back it up. The cradles proudly boast a heavy-duty one-piece steel design that will securely hold your hold your favorite water toy securely with no need for straps. Simply place your boat into the cradles for worry-free storage. The 13” wide cradles hold your board in place while the foam covering protects the finish and prevents any slipping. Installation in quick and easy, four bolts on each cradle fasten directly into your wall studs, all mounting hardware is included.